Everything from lawn mowing to whipper snipping to edging. And not limited to weeding rubbish removal as well. 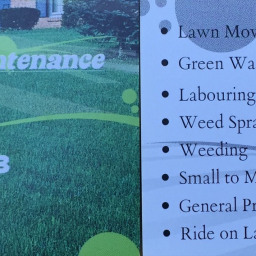 Not to mention l do landscaping too. Other jobs I can do is Rubbish removal to bobcat to excavator work as well. Or need soil removed just ask I can get this done as well. Can also do all types of furniture moves as my Ute and trailer are setup and have all the tools to move your furniture safely. If your Task isn’t listed just ask and l will let u know if l can do it. May D. said “Thanks Chris for being a very good help and a job well done to us,communication is very good and a well trusted man,highly recommended. Removal of small tree and branches off carport. Vick F. said “arrived on time, hard working and got the job done. Cleaned up after himself. Need approx 50 sheets of plywood picked up. Hemant B. said “Great Guy! Remove 2 X garden hedges. Christine L. said “Fantastic service, I am so happy I found Airtasker and Chris F. He and his mate (sorry forgot name) did the job quickly, well and at a great price, can't ask for more! I will be recommending the service to everyone. and hoping Chris es back to do another job for me.